Civilian employees working for the Army Air Forces were not required to wear any type of distinctive dress. 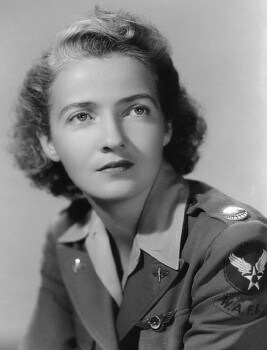 However, Nancy Love insisted on having her girls uniformed to receive a better attentiveness in public and to boost the moral of her pilots with providing a smart uniform. 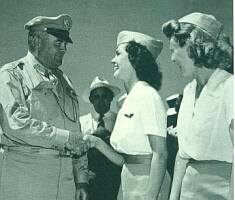 She ordered a local tailoring shop in Wilmington, Delaware to procure distinctive uniforms for WAFS personnel. These uniforms had to be purchased privately by the WAFS. ..... The Service and Dress Uniform consisted of a belted jacket with matching six-gore skirt or trousers made of grayish-green wool serge. It was worn with a piped garrison cap made of the same fabric. The garrison cap was in the same style as the men’s garrison caps but had the front curtain fold on the left side. The General Army Airforces Headquarters patch was worn on the upper left sleeve. A half-circle tab with the letters WAFS embroidered in blue was sewn below the AAF patch. Above the left breast pocket, the Air Transport Command / Ferrying Division (ATC/FD) wings were worn and the ATC/FD disk on the shoulder loops. .... The grayish-green WAFS uniform was worn with a khaki shirt for duty and a white shirt for formal occasions. The collar of the shirt was worn open over the uniform jacket. Brown oxford shoes or plain brown pumps (if the skirt was worn), brown leather gloves and a brown leather purse completed the outfit. .... 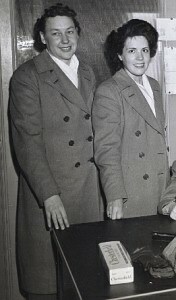 The gray woolen overcoat with buttoned-in lining was double-breasted and was equipped with four pairs of gray plastic buttons. The coat had a half belt on the back. It could be worn with a white scarf. 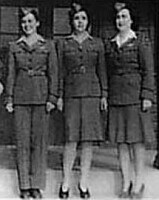 Like the WAFS, WFTD members were civilian employees of the Army Air Forces. Therefore, they were not issued official Army uniforms but had to wear civilian clothes. However, when the first class approached graduation, requests about an official uniform for the WFTD arose. To keep the costs for the WFTD trainees low, it was decided that they should wear private purchased khaki slacks with a short-sleeved white shirt for graduation. The collar of the shirt was worn open and a men’s khaki garrison cap without piping completed the outfit. 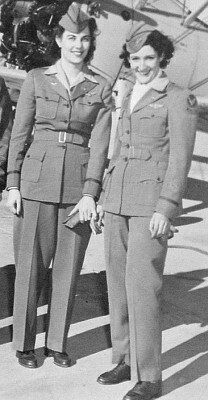 Also, the WASP trainees wore this uniform nicknamed "General's White" until the Santiago Blue WASP uniform was introduced. v... The white shirt with khaki slacks and cap combination could be also worn with the A-2 leather jackets. 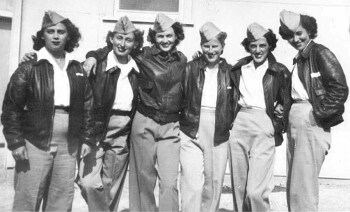 On the black and white picture taken at Avenger Field, Sweetwater, Texas, in 1944 are (from left to right) Patricia Nethercutt, Beryl Owens, Jimmie Parker, unknown, Jeanne L. Norbeck, and Frances Opavski.
. After graduation, WASP assigned to the ATC/FD wore civilian clothes at first. Later, the ATC/FD ordered to wear Army officer's "pinks and greens". The "pinks and greens" consisted of combinations of light drab (pink) or dark olive drab trousers and light drab (pink) or dark olive drab shirts. A tan or olive drab tie was worn with the shirt and webbing belts in the same colors were worn with the trouses. A light drab (pink)or a dark olive drab men's garrison cap with gold-black officer's piping completed the outfit. The following insignia were worn with this uniform. The AAF General Headquarter's patch was sewn on the upper left sleeve of the shirts. The WASP wings were worn above the left breast pocket and a small pair of wings with the vertical silver propeller, as used by the Air Corps, were pinned on the lapels of the jacket and on the left front of the garrison cap. During warm weather, graduated WASP wore khaki shirt and khaki trousers. A men's khaki garrison cap with gold-black officer's piping could be worn with this outfit. The Army Airforce General Headquarter's patch was sewn on the upper left sleeve and the WASP wings were worn above the left breast pocket. WASP - Santiago Blue Dress Uniform .